One of the least studied and underreported generators of plastic and non-plastic waste are e-commerce companies. In 2017, e-commerce accounted for US $2.3 trillion of the US $23.24 trillion global retail market. According to the US Environmental Protection Agency, e-commerce packaging accounts for 30 per cent of solid waste generated in the US. India’s e-commerce packaging industry was worth US $32 billion in 2015 and is expected to grow rapidly to about US $73 billion by 2020. Flipkart, for instance, does around 8 million shipments every month. But there are no estimates about the amount of e-commerce packaging or the disposal of waste, as no organisation has bothered to investigate the same. 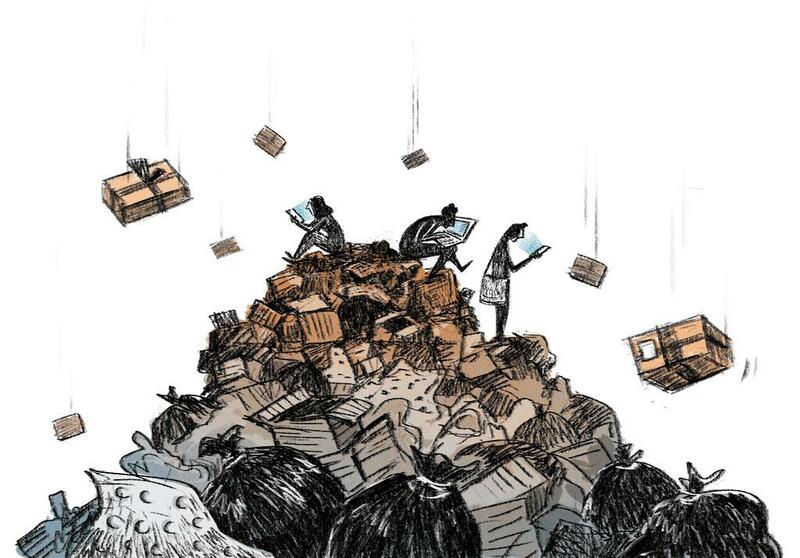 E-commerce packaging and the disposal of waste have huge environmental costs. At present, e-commerce packaging comes in multiple layers, which is made of plastic, paper, bubble wrap, air packets, tape and cardboard cartons. While most of these packaging materials are recyclable, India’s abysmal record indicates that a large portion of these materials will end up clogging our drains and landfills. The problem of excessive packaging has been exacerbated due to the growth of priority customer services that place a premium on ultra-fast delivery which do not allow for consolidated delivery of packages. This is leading to multiple individually packed deliveries thus increasing the generation of waste. In addition to increasing the waste generated in India, the growing trend of excessive packaging will certainly lead to considerable loss of forest cover, as wood pulp remains the main raw material for making packaging cardboard. For instance, around 165 billion packages are shipped in the US each year, and the cardboard used would roughly equate to more than 1 billion trees being chopped. Moreover, the toxic chemicals used in the production of these packaging materials are bound to affect human health as they enter our food cycle. Some of these chemicals are brominated flame retardants, polyvinyl chloride and Bisphenol A, which is an endocrine disruptor. Many companies use a possible carcinogen called Styrofoam, which is used as a common filler. Long-term exposure to even small quantities of Styrofoam can cause fatigue, nervousness and sleep disorders. Vinyl chloride, which is used to manufacture PVC, can severely impact the central nervous system causing headaches and dizziness. Long-term exposure to vinyl chloride can result in cancer and liver damage. Yet there are no studies to establish this link. At present, there is no law in India that regulates e-commerce packaging and it is clear that there is an urgent need for the creation and stringent implementation of the same. Such a law must be grounded in the doctrine of Extended Producer Responsibility (EPR), which mandates that the producer of the waste shall be responsible for its end-of-life recycling and disposal. The EPR doctrine is a proven doctrine that has resulted in some of the highest recycling rates in the world. The Solid Waste Management Rules, 2016, states that producers of packaging products such as plastic and corrugated boxes must take up the responsibility of collection, recycling and disposal of such waste in accordance with environmentally sound principles. Further, the Plastic Waste Management Rules, 2018, also place the primary responsibility of recycling and collection of plastic waste on the producers, importers and brand owners who introduce the material in the market. Any law that aims to regulate e-commerce packaging must address some critical issues. Firstly, standard packaging rules akin to those Legal Metrology (Packaged Commodities) Rules, 2011, must be framed and enforced on the sector. Secondly, the law must regulate the method and materials used for e-commerce packaging based on scientific and environmentally sound principles. There is also a need for companies to invest in smaller and more sustainable, environment-friendly packaging. This will automatically reduce packaging volumes as well as costs. At the same time, e-commerce companies must factor in three different aspects of sustainability to ensure sustainable packaging—those of reduction in the amount of packaging materials used; increase in the recyclability of the packaging materials; and, increase in the use of recycled packaging materials. They should also explore the possibility of implementing buy-back policies, or even provide customers with the choice to choose more sustainable methods of packaging. A carefully drafted law and genuine cooperation among all stakeholders, including e-commerce companies, consumers and local municipalities will be the key to ensure that the law is successfully implemented. The recent extension of Maharashtra’s plastic ban to e-commerce companies is a welcome step and one whose implementation could hold valuable lessons for other states. While it is understandable that sturdy packaging materials must be used to reduce damage to products in transit and during handling, but excessive use of plastic and other materials is environmentally unsustainable. Optimisation and innovation hold the key to a sustainable packaging revolution in India. (This article was first published in the 1-15th August issue of Down To Earth unde the headline 'Unwrap the e-commerce waste').